[GEORGE WASHINGTON]. Textile. “America Presenting at the Altar of Liberty Medallions of Her Illustrious Sons” ca. 1783-1785. 26¼ x 44 in. This copper-plate printed textile displays a kneeling neoclassical plumed goddess representing “America” presenting medallions of her heroes at the altar of a seated “Liberty,” while a winged angel “Fame” or “Victory” blows a trumpet with a banner “Washington and Indpendance” and crowns George Washington with a laurel wreath. Washington is guided by a female figure of “Peace.” An inscription at the base of the altar gives the piece’s title, “AMERICA PRESENTING AT THE ALTAR OF LIBERTY MEDALLIONS OF HER ILLUSTRIOUS SONS.” The medallions feature Baron von Steuben, Gouvernour Morris and John Jay, George Washington and Benjamin Franklin (in fur cap), Samuel Huntington and John Dickinson, Charles Thomson and William Drayton, and John Adams and Henry Laurens. The image of Washington is a reversal of the 1780 John Trumbull painting of the general. The medallions are based on portrait drawings of famous Americans by Pierre Eugene du Simitiere (1737-1784), engraved by Benoit Louis Prevost (1735-1804), and published by William Richardson, in London, 1783. The new American nation embraced a new taste for classical symbolism to illustrate components of its government and republican civic culture. Elites expressed these neoclassical values through oratory and dress, as well as in architecture, painting, sculpture, and the decorative arts. 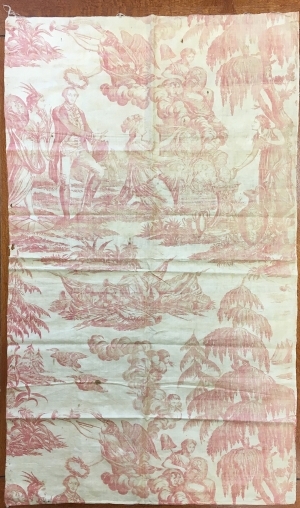 The textile was likely woven and printed in England for an American market. Generally, very good. A few minor frays, holes, and cloth folds. Print was originally deep red on white ground.